Natures Turn: Natures Turn Studio.Wearable and Utilitarian Art, turned woodenJewelry,carved spoons, bowls and whatever else is in the log. 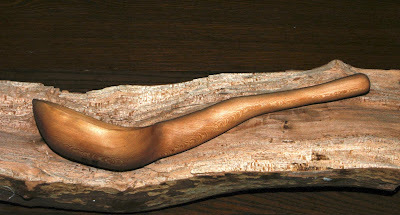 Visual Art, Wood and Stone Sculptures and Turnings. Sculptor and Turner, Artist Rickey Noel Mitchell, creates art in stone and wood, inspired by wildlife and nature of the Northwest. Natures Turn Studio.Wearable and Utilitarian Art, turned woodenJewelry,carved spoons, bowls and whatever else is in the log. Visual Art, Wood and Stone Sculptures and Turnings. This piece was a sycamore log 6” X 2’ that sat on my drying shelf's along with the rest of my special wood stash for close to 30 years, (So it was definitely dry. )before I laid into it. To make sure the structure of the log was as strong as possible, I split it with a broad axe. Then I smoothed it out a bit on the band saw so I could do some rough sketching on it. 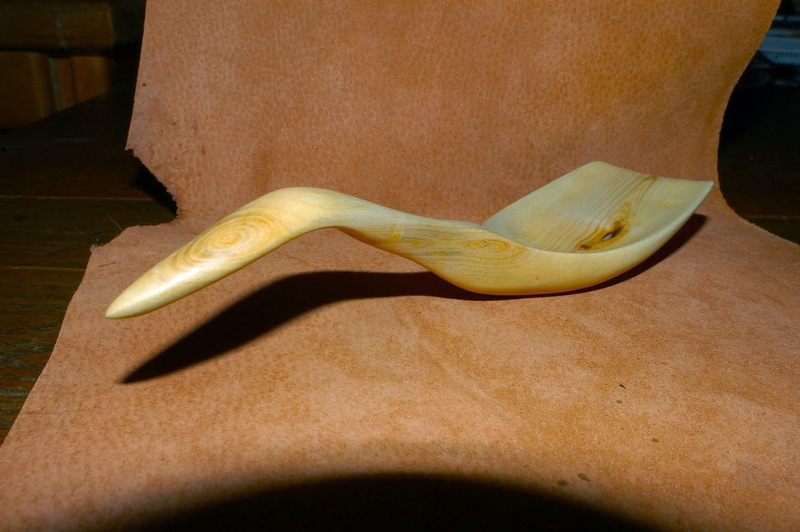 ladle form. With a definite ideal of the form I wanted from the sketching, I gouge out the bowl first. After I was satisfied with the bowl I went back to the band saw and cut out what I’d sketched on the wood. The results were a rough looking version of the ladle I was trying to create. 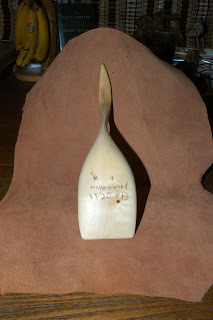 With one of Del Stubb’s extra long sloyd blades, I’d just carved a handle for a month before, I carved the dry solid sycamore blank to the point where I could smooth it out with a flexible shaft tool (Foredum, power carving tool,). I hand sanded the ladle with 120, 220,and 400 grit merit sand paper to get the finished results you see. If this sycamore would have been green I probably would’ve used an axe. Boy...do I look forward to working some greenwood.